Jeanne McFall P.E., Idaho Fish and Game Hydraulic Engineer, will explain the design and function of the three engineered log jams and instream boulders that were placed in the Boise River by Eckert Bridge in 2016. Ada County Parks and Waterways Director Scott Koberg, IDFG Regional Fisheries Manager Joe Kozfkay, and IDFG habitat Biologist Michael Young will also be on hand to answer questions about permitting, construction and cost. 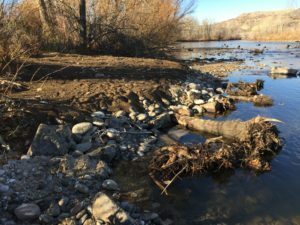 The project was a cooperative project funded by ENEL Green Energy, Ada County, and Idaho Fish and Game Southwest Region with support from Ted Trueblood Chapter of Trout Unlimited and Boise River Enhancement Network.